On 27 July 2018, the Steakhouse at the Verandah took over the space on Deck 8 traditionally occupied by the Verandah specialty restaurant on Queen Mary 2. Whereas the Verandah had featured French-inspired fine dining, the Steakhouse is a sophisticated version of the steakhouse concept. The Steakhouse “Takes away a little bit of the formality but still retaining the formality.” commented Robert Howie, Hotel General Manager. The door is still open as to what will happen if the steakhouse concept proves successful. 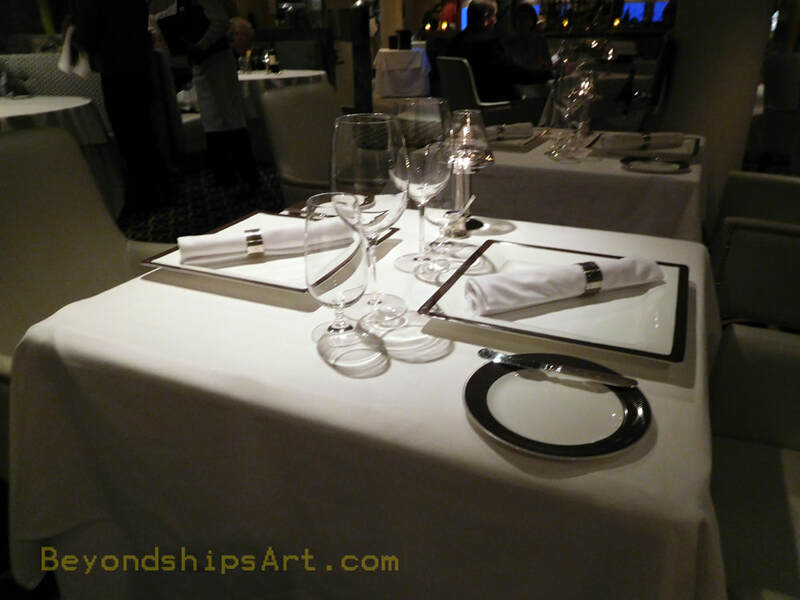 It could be a venue on Cunard's next ship or it could be incorporated into the specialty restaurants on one or more of Cunard's existing ships. The Steakhouse at the Verrangh is more than just a change in the menu. A number of physical changes accompanied the changeover to the Steakhouse. The biggest of these was that the area to the left of the bar as you enter the restaurant was changed from dining tables to a number of smaller tables. This is to make it more attractive for guests to sit and have cocktails before dinner. A new bar menu featuring new cocktails has also been implemented. The table settings have also changed. The new setting centers on a plank with a large serving plate upon it. 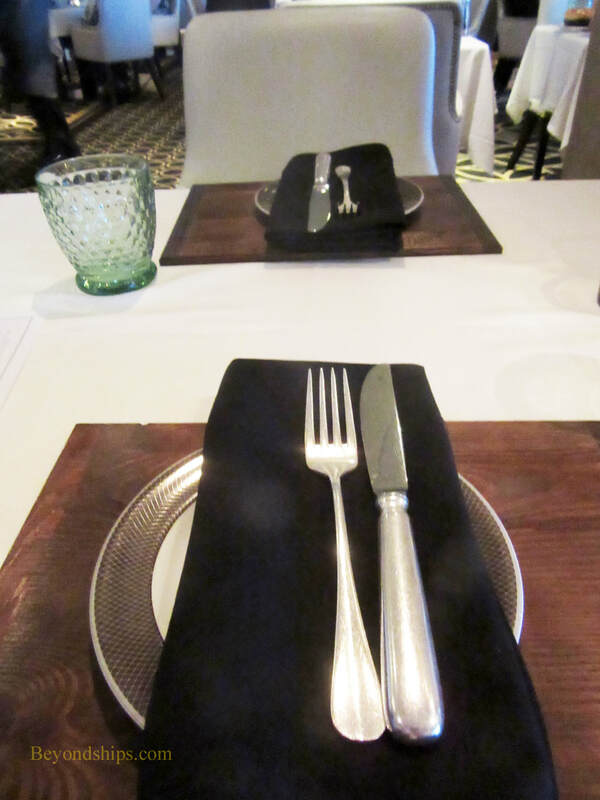 New cutlery with a less formal design surrounds the plate. The waiters are less formal as well. They now wear long black aprons. Clearly, the aim is to produce a more relaxed atmosphere. Other than these changes, the restaurant looks much as it did when it featured French cuisine. It is still a sophisticated venue. The paintings on the wall still recall the paintings done by Doris Zinkelsen in the Verandah Grill on the original Queen Mary. Several changes have been made to the presentation in order to make the restaurant more like a steakhouse. At dinner, if you are interested in having beef for the main course, the server brings out a tray with uncooked versions of the various available cuts. He or she then explains the virtues of each of the cuts. If you select one of the beef cuts, the server brings out a box with various types of steak knives. The waiter then explains which knives work best with which cuts and which version of the knives were designed for feminie hands and which for masculine. The choice of weapon, however, is up to the guest. In the Verandah's previous incarnation, the vegetables and other sides were presented in an artistic design on the same plate as the main course. In the steakhouse, the sides arrive in separate copper pots. This approach is consistent with most seagoing steakhouses and makes it easier to share the sides. However, most of the tables in the Verandah are rather small and so the table can get crowded if you order a number of side dishes and sauces each of which comes in its own container. The steakhouse dinner menu is diverse. (The lunch menu is an abridged version of the dinner menu). In addition to steaks, it offers Dover sole, roast chicken, Iberian acorn-fed pork chops, lamb cutlets, and Louisiana short rib. For an additional fee, you can have a seafood platter that includes Maine lobster, Alaska King Crab and scallops. 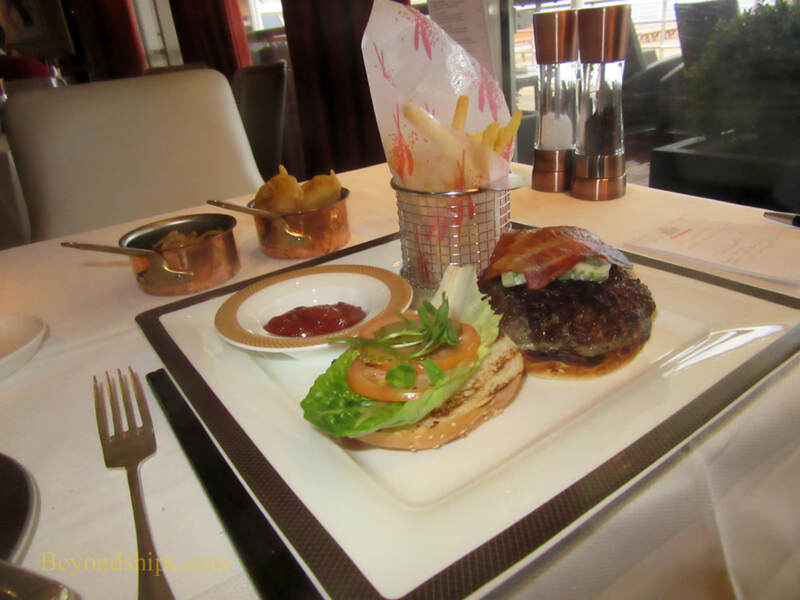 One new item that may come as a surprise given Cunard's sophisticated image is the "Cunard Burger." However, this is no Big Mac. Rather, it is more akin to the burger served at New York's legendary 21 Club, made with premium beef and enhanced by its own sauce, contrasting spices and vegetables. We found it quite good. Of course, the stars of any steakhouse have to be the steaks. The Verandah offers three categories. First, there is Darrah O'Shea's 35-day dry aged Scottish Angus beef (12 oz, rib eye, 8 oz filet, 12 oz sirloin). Second, there is a 12 oz New York Strip steak made from 28-day aged prime USDA grain finished Angus. Third, there is a 7 oz sirloin made with Australian Grass-fed Wagyu beef. (There is an additional charge for the last category). 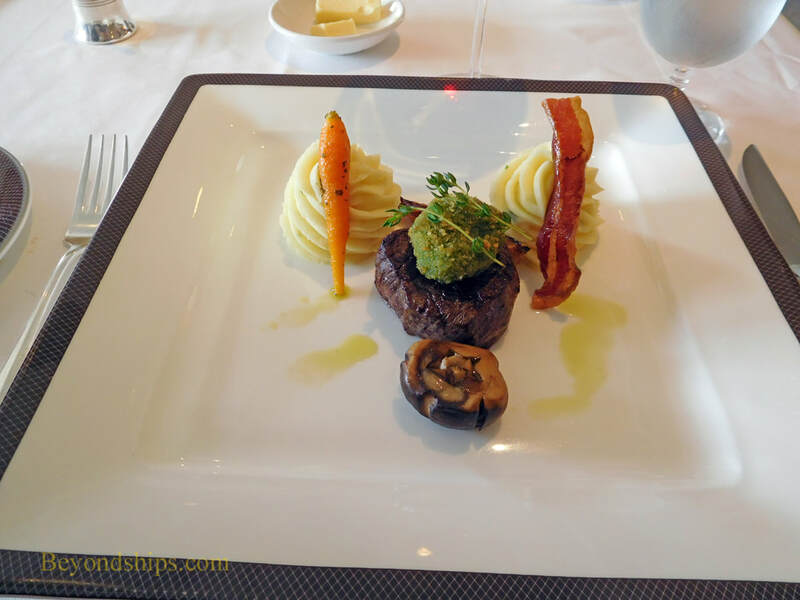 In order to compare the Verandah to steakhouses on other cruise lines, we selected the same cut that we have ordered at other steakhouses - - filet steak. Our experience has been that if a restaurant can prepare filet steak, it can do a good job on other cuts. Although somewhat underdone, we found the fillet to be in the same league as the steakhouses on the other major cruise lines. 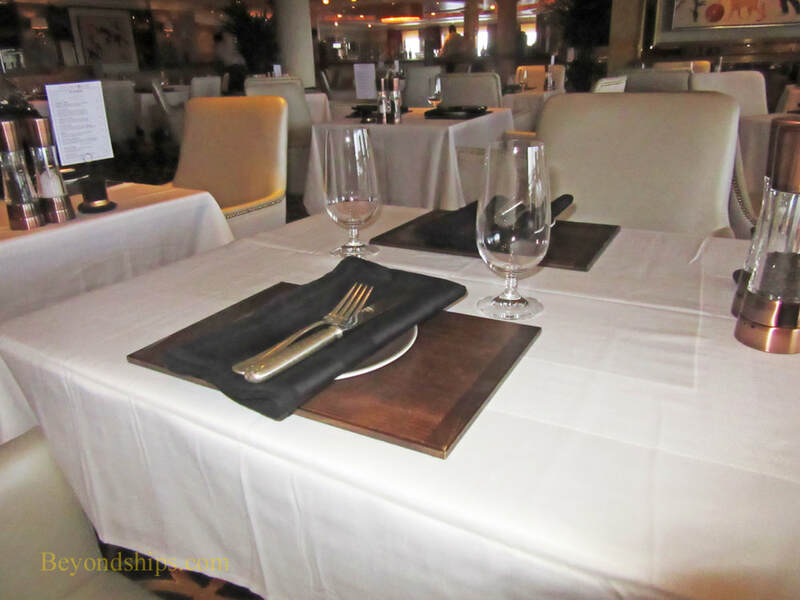 With more experience with this menu, the Verandah could vie with the likes of the Crown Grill (Princess), Pinnacle Grill (Holland America), Cagney's (Norwegian) and Chops Grille (Royal Caribbean) for the best steakhouse at sea. While steakhouses have proven popular on other lines, there is the question whether it is a concept that fits with the Cunard lifestyle. The answer to this question clearly appears to be yes. We had lunch at the Steakhouse on its first full day of operation and there were only a few tables occupied. By the time we came back for dinner later in the crossing, the restaurant was very busy. Indeed, we were told that there were twice the number of customers as when it was serving its French-inspired menu. Positive word of mouth had clearly spread through the ship. The difference in the table settings reflect the change in approach between the steakhouse (above) and the French-inspired fine dining Verandah (below). 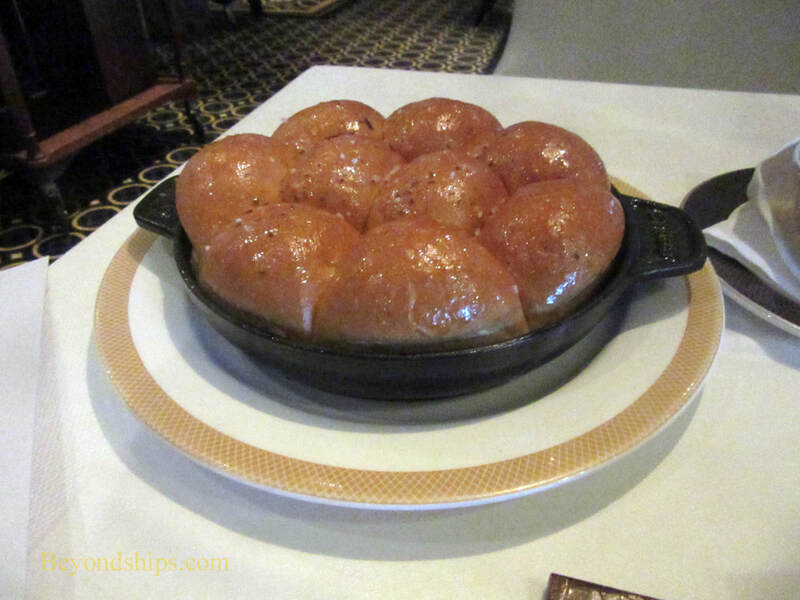 Above: The new brioche style bread with maple butter is a tasty meal in itself. ​Below: The Cunard Burger is another positive creation. 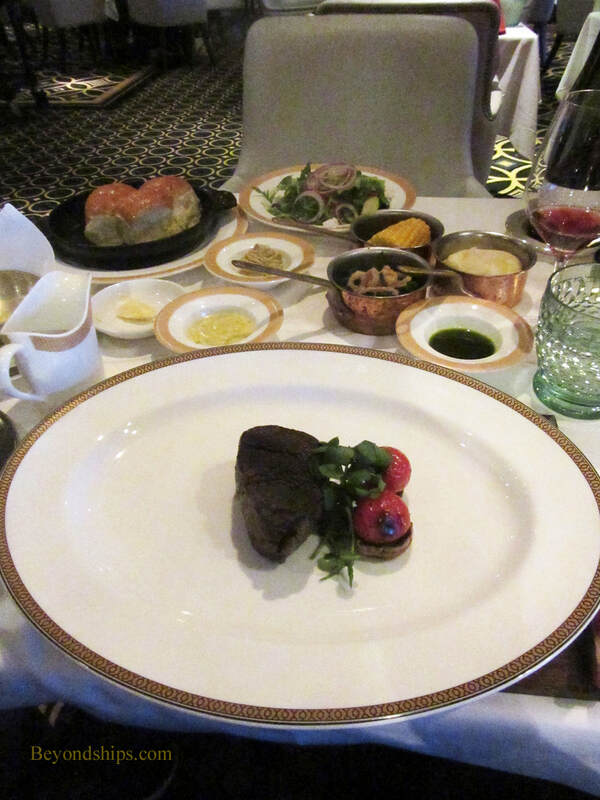 The presentation of the food at the Steakhouse (above) is not as elegant as before (below) and the small tables are not well-suited for a variety of sauces and side dishes each in their own container. While the Steakhouse is an attractive concept, there is something to be said in favor of a fine dining venue that offers grilled Maine lobster with Thermidor Charantes butter, hot pistachio souffle and an elegant tray of petit fors at the end of the meal.